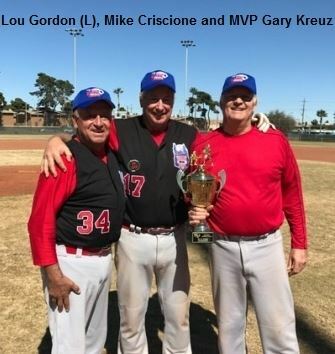 The 55+ Chicago North Legends went undefeated (4-0-1) in winning the 2017 MSBL Las Vegas Kickoff Classic – but it was by no means an easy go. Three “come from behind” efforts were required. We tied our eventual Finals opponent (the 3n2 Rangers) 8-8 after falling behind early with a late inning rally in game one of pool play. Jim Kuhn and Mike Criscione kept us in the game on the mound against a very good hitting team. Game two was easier with our MVP Gary Kreuz on the mound and Bruce Grossman pounding triples all day. Game three required another big comeback from an error-filled 9-1 deficit. Larry Burton was solid on the mound and once the defense and offense picked up, we won 13-11. Alden Steifel was his usual “Bulldog” self in a severely wind affected first playoff game – as he threw a shutout and we won 11-0. The championship game was crazy. We trailed 5-1 after two innings. Tom Foote took over on the mound in the third inning and pitched the rest of the way. We kept at it and got to within one run twice but the Rangers tacked on a couple more here and there. We trailed 9-6 with two outs and nobody on in the top of the ninth. Things looked bleak but this team NEVER quits. Billy Dew started the rally with a hit and we never stopped. Criscione got a big 2-run hit to tie the game and Kreuz got the winner, but we kept on going winning 15-6. Our hitting heroes were many during the tournament, including Matt Baer, Jim Doyle, Tom Foote, Bruce Grossman, Bill Dew and, of course, Gary Kreuz. The rotating outfield defense of Jeff Jacobs, Gene Zaleski, Carl Franco, Matt Baer, Bill Dew, Tom Behringer, Glenn Gaffney and Bruce Grossman was stellar and the double play combo of Foote and Doyle turned several key double plays. Our three headed catching monster of Zaleski, Steifel and Todd Tallmann made things so much easier for the pitchers with their game calling and throwing out potential base stealers. All in all, it was a great team effort and a hell of a lot of fun. We look forward to going back next year with a target on our backs!